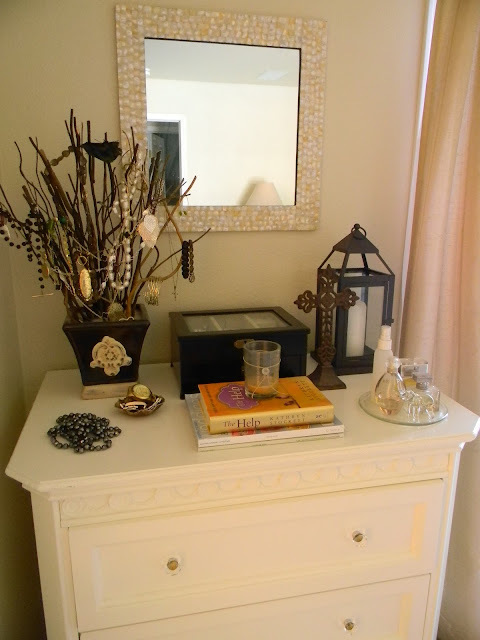 Just outside our bathroom, I have this little dresser that has become my place for some of my jewelry and perfume. It's my last "stop" in the morning before heading out to work! And below the tree, I keep my two watches in a little clay bowl that was also a great gift...from a craft fair. It keeps them together and adds a nice touch. I love this jewelry box and believe it or not, I got it at Pottery Barn! It even has a little key to lock the top portion. I didn't really "display" the jewelery here (trying to keep it real!) 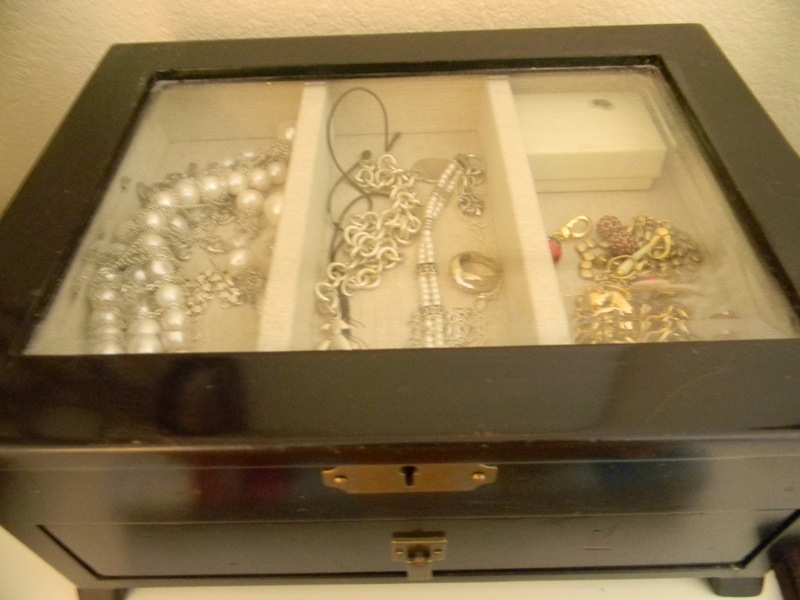 but you can see my wedding jewelery on the left (last seen here) and some keepsakes in the other compartments. 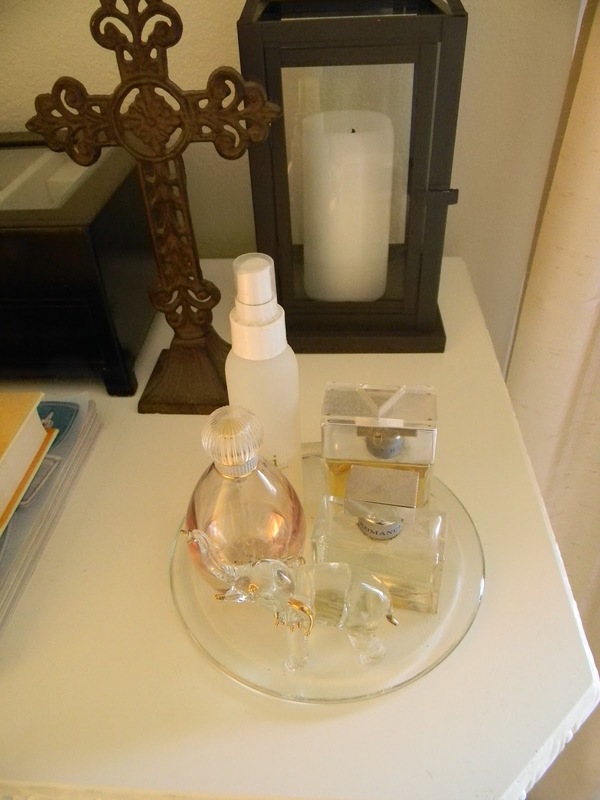 I like to display my perfume in some sort of fashion...this plate is actually a glass candle holder. And if you look hard enough, there is a glass elephant figurine up front. The raised trunk means "good luck!" 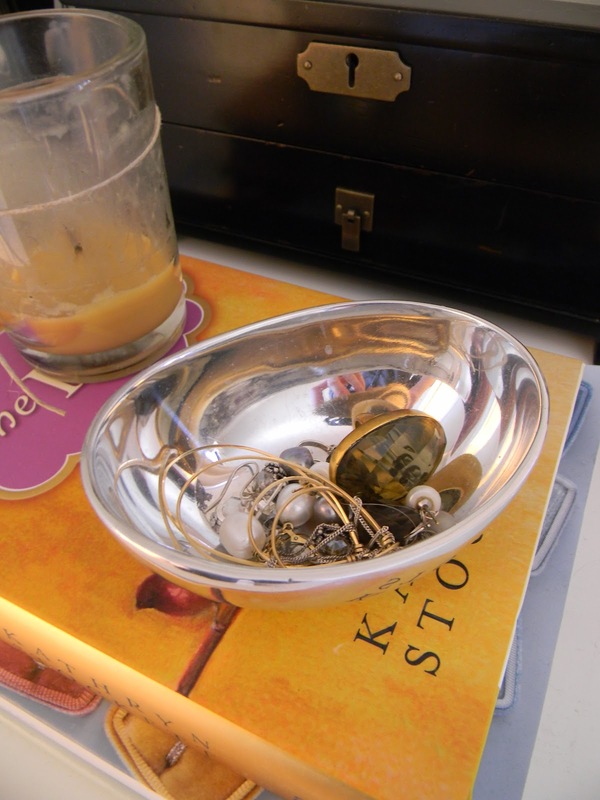 Last, I like to keep my little earring studs and rings in this silver bowl. It makes it much easier to keep track of both pairs of earrings and I always know where my wedding rings are. So how do you store your jewelry? I love hearing new ideas! 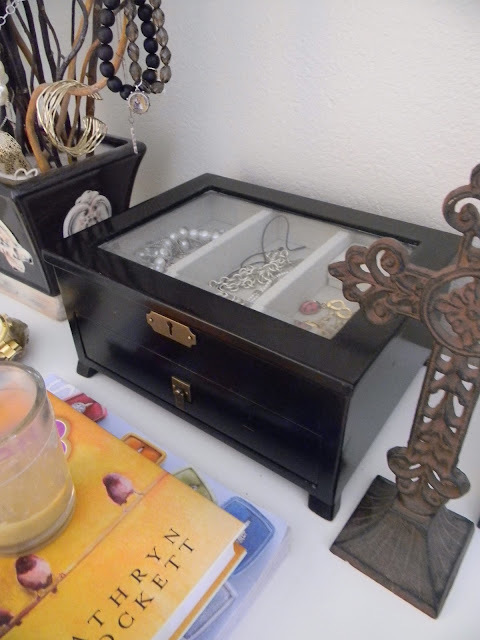 I love the idea of having a little jewelry/perfume stop on your way out the door. You've displayed everything beautifully, that tree is amazing! I love that tree! You definetly need a tutorial for making one. That is such a great way to display jewelry! Love it! dying over that jewelry tree! I want one---but I know our kitties would attack it ;) I have one of those ceramic hand things for my rings and some very not cute plastic containers which go in a drawer for my other jewelry. One day, my presentation will look half as cute as yours. I LOVE this! Mine is in a closet and not out and about at all. Hmmm. Might be rethinking this. I love the tree. Such a great idea. I may have to try it myself. Gorgeous gorgeous gorgeous! Your set-up is really beautiful. Everything looks pristine. I want mine to look that way! Such a pretty display! By the way, how GOOD is "The Help?" I read it a couple of months ago and loved it! 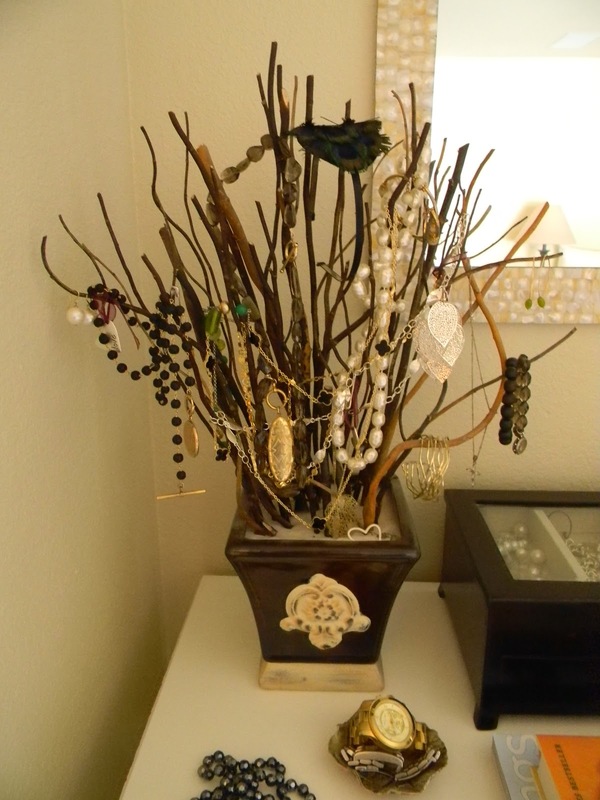 Love your jewelry display! The tree is such a neat idea! Oh and I love, love your mirror!! Thanks so much for stopping by my blog! I really appreciate you taking the time to leave me some love!